Version 2.0 is now available (Sept.13). 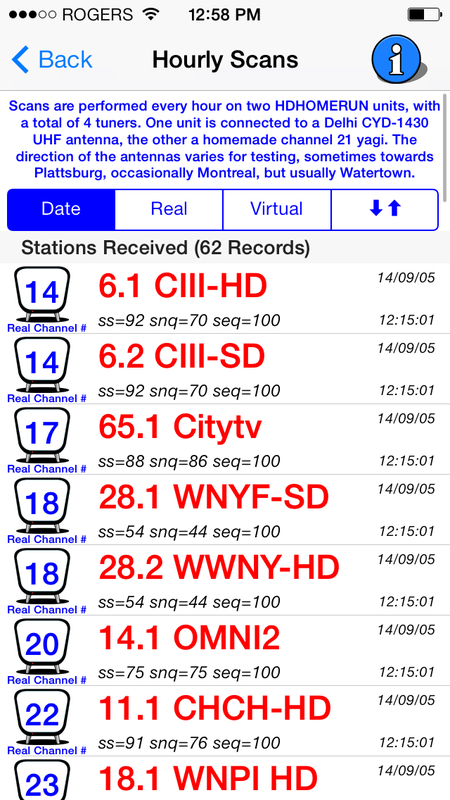 •Added Ottawa area antenna scan info. Hourly antenna scans from East end Ottawa. •Added iAds in version as a test for doing this for future applications. OTAOttawa, a free iPhone/iPad app providing TV listings to Ottawa over the air viewers. It is now available in the app store. A free web widget version is also available here. OTAOttawa is a quick app I wrote for the use of Ottawa Over The Air (OTA) enthusiasts. I wrote it in 4 days, if you have any ideas for new features or questions email me, please dont flame me in iTunes. Remember it is a quick semi-useful free app! Sure there are many things I could do to add functionality, but I could never justify the time spent. I will consider your ideas and time/wife/babies permitting, I will implement any suggestions. 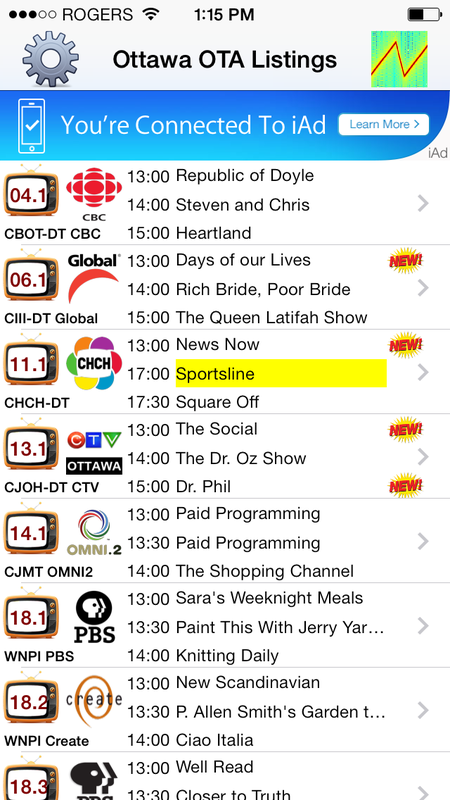 Under the preference section, you may remove or add from your listings any Ottawa OTA station. Although I believe that I have included all possible OTA stations, if you do receive regularly a station not listed, please contact me and I will try to add it. 5 Station presets are provide to help set your received station list. None, All, Ottawa, Ottawa English, or US Stations. All pref. changes made come into effect the next time you enter the app. From the settings page you can also access the wikipedia page of any station. On the program detail page, a program may be added to your watchlist. The watchlist will highlight the program everytime it appears in your listing from then on. On the same page (program detail page) you may access the Watchlist and remove any entries. To keep costs down and ease of maintenance, OTAOttawa currently resides on my home server. The server currently serves OTAOttawa, another app Word-A-Maze and some of my websites. My provider is Rogers. While both my server and ISP have been fairly reliable, occasionally it may go down. If so please be patient. As soon as I notice an issue or service is returned, I will restore. If the app is down for an extended time, please email in case I havent noticed. This particular app was written using Perl and dynamically generated HTML on the server and OOC on the iPhone/iPad. It was tested on an Original iPad, latest iPad, iPhone 3g, iPhone 4 and an iPhone 5. Upon startup, file sizes will be typically 50k - 100k. Larger for the lucky ones who can receive more stations. Loading time is usually 5 seconds. I did the app as a new genre, since it is not a paid app, ad subsidized or even donerware. I call it "Resumeware". Due to the arrival of my beautiful baby twins Annika & Thomas, I may need a regular job again. I am an ex-Nortel/BNR designer with lots of experience in all kinds of software, project management and product support. My CV is available upon request anytime. I am willing to work in any area, for a large company or even a startup. I have to buy diapers for the kiddies!